Kobo seems to be on a roll these past few weeks. 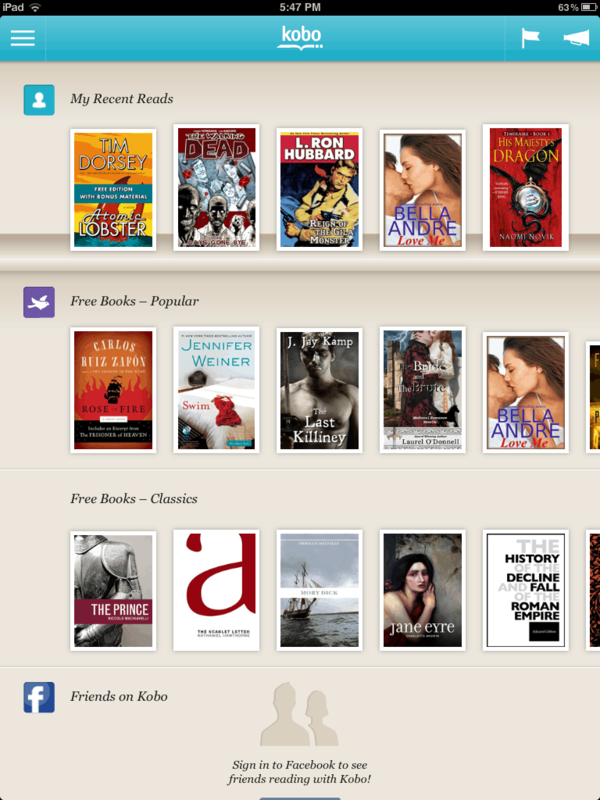 In addition to pushing out an update for their Android app, Kobo has also released one for their iOS app. The update adds a new storage management menu, a feature which I'd already been using on the other Kobo iPad app (Kobo Instant Reader). You now have more granular control of the ebooks on your iPad or iPhone; no more having the app download everything. The update also adds the usual under the hood improvements and bug fixes, including an issue where specific books failed to open. The app also now supports sideloaded ebooks which are encumbered by DRM, and it gained slightly improved support for PDFs (links are now clickable). And the app now reportedly supports more languages, including French, Spanish, Italian, German, and Dutch. I don't see these as options int he settings menu, but I'll take their word for it. I will note though that they've been selling ebooks in Germany and France for over a year; I wonder why it took so long for Kobo to support their customers? But what caught my eye was the note about Adobe DE DRM. Kobo's apps didn't used to support Adobe's DRM, so any change is noteworthy. I know that may sound like an odd reason to keep track of DRM support, but there's a back story here. From what I've heard, the reason Kobo didn't support the DRM was to avoid having to pay fees to Adobe. Instead they used their own DRM inside of their apps, and only used Adobe's DRM with ebooks you bought from them and wanted to take elsewhere. I'm sure there's a simple explanation for the change; Kobo isn't nearly as cash strapped as they were back when they were owned by Indigo. Rakuten is clearly throwing money at them. And that's the important detail. Without all that extra money Kobo never really had a shot at competing with Amazon. Change language setting in the International portion of General settings, say to French, then launch the app and it’ll be localized. There did used to be a separate app, think it was called Kobo International, but it only showed up in certain App Stores, Canada had it (presumably for French Canadians) and I know the German store had it too. It seems to be missing now, so I’m guessing this new app takes over from it. I do remember having a look at it, not too long ago and it did look and feel very different, so am guessing it was an older version of the app, and the new one is obviously the very latest, so there would be feature updates for users who did have the older app, guess you’d just need to sign into the new app and off you go. Yeah, iOS does things strange like that. Never mind if I just need this one app in another language; make me do things the hard way. And I couldn’t find the international version of the Kobo app either; It’s not in the German or French iTunes. Out of curiosity, is there a reason why you would want to change the language in just a single application, rather than applying these settings to the OS as whole? As for the international version, I’ve just looked and it seems the app isn’t there, my guess is, as mentioned previously, that it’s been superseded by this new one. Often times a device might be used by more than one person or for more than one use case. Let’s say I’m tasked with supporting a user for whom English is a second language. I’d like to have their apps in their language so they can use them. But I also want the rest of the system menus in English so I can do tech support. I downloaded Kobo app on my Samsung tablet and then I tried to download the book it shows a spinning circle and will not download the book – what do I need to do – Samsung is compatible with Kobo?? Try to download a different free ebook. Then try restarting the tablet, and see if the app works after that.